The coup in Kiev also made Oleksandr Turchynov the acting President of Ukraine. On February 25, Turchynov assumed the duties of the supreme commander-in-chief of the Ukrainian Armed Forces. While some American Baptists are reporting that Turchynov is a pastor or an elder at his church, the Word of Life Center in Kiev, they are missing the point. The Word of Life is a Zionist organization posing as a church. It was established by a Swedish Jew named Ulf Ekman, who created a church called “Livets Ord”, which established evangelical churches throughout the former Soviet Union in the early 1990s with the express purpose of finding and funding Jewish emigration to Israel. and its pastor, the former head of Ukrainian intelligence, Oleksandr Turchynov, who is now the acting president of Ukraine. Pray tell, what kind of church is this? As the Wikipedia article about “Livets Ord” says: In conjunction with Christian Zionists in the United States, Livets Ord operates a fund to supply money to Russian Jews who want to move to Israel. The fund, named “Operation Jabotinsky”, is named after Russian Vladimir Jabotinsky. Vladimir “Ze’ev” Jabotinsky (1880–1940), was a radical (i.e. revisionist) Zionist leader who established a number of Jewish terrorist organizations such as Beitar, Hatzohar, and the Irgun. The Irgun is the terrorist group, headed by Menachem Begin, that bombed the King David Hotel in Jerusalem. Begin founded the Likud party from the former members of these Zionist terrorist groups in the 1970s. The fact that “Livets Ord” runs “Operation Jabotinsky” to find Jews in the former Soviet Union to send to Israel indicates that it is working closely with the Mossad, the branch of Israeli intelligence that was originally created to facilitate Jewish emigration to Palestine. As I discovered in Estonia, a pastor from “Livets Ord” went on to work for U.S. military intelligence (See: “Note from Christopher Bollyn”, March 28, 2009). This brings me to another aspect of the EuroMaidan protest that reeks of U.S. meddling in the internal politics of the Ukraine. What I found in Estonia was that the so-called patriotic press was controlled by U.S. military intelligence asset Aleksander Einseln. Einseln was the retired U.S. Army officer from California who went to Estonia in the early 1990s to head the military of the newly-independent Estonia. What I discovered through this contact was that this “patriotic press” outfit controlled by General Einseln had several hundred skin-heads that it could mobilize for mob actions. This indicated that the “skin-head” movement in Estonia was actually a controlled mob that could be called upon by agents of U.S. military intelligence to create mob violence wherever and whenever needed. Given what I have seen about how the U.S. military intelligence has cultivated hordes of agents in every country of the former Soviet Union through its programs at the Marshall Center in Garmisch-Partenkirchen, Germany, I would think that the skin-head situation in the Ukraine is not very different from what I found in Estonia. Their bosses probably attended the same courses at the Marshall Center. On February 20, snipers opened fire on the protestors and the police, killing many on both sides with shots to the head. This is the same kind of false-flag terrorism tactic that has been used by the rebels fighting against the Syrian government. An atrocity is committed with the intention that it will be blamed on the targeted party, in this case the Ukrainian president Viktor Yanukovich. According to a leaked report from an Estonian diplomat who was in Kiev shortly after the killings, it now appears likely that the snipers were working on behalf of the opposition – not the Yanukovich government. Video evidence taken during the shooting indicates that the protestors were being fired on from the rear, evidently from the multi-story hotel controlled by the Maidan protestors behind them. In an intercepted phone call between Estonian Foreign Affairs Minister Urmas Paet and EU Foreign Affairs chief Catherine Ashton, Paet, who had just been in the Ukraine, can be heard telling Ashton that it was not Ukrainian President Viktor Yanukovich who was behind the sniper killings of people in the Maidan, “but it was somebody from the new coalition.” This exchange can be heard from about 8:15 to 9:15 in the video that contains the entire phone call between Paet and Ashton. Urmas Paet: What was quite disturbing, this same Olga told as well that all the evidence shows that the people who were killed by snipers from both sides, among policemen and then people from the streets, that they were the same snipers killing people from both sides. Ashton: Well, yeah…that’s, that’s terrible. Paet: She then also showed me some photos she said that as a medical doctor she can say that it is the same handwriting, the same type of bullets, and it’s really disturbing that now the new coalition, that they don’t want to investigate what exactly happened. So there is now stronger and stronger understanding that behind the snipers, it was not Yanukovych, but it was somebody from the new coalition. 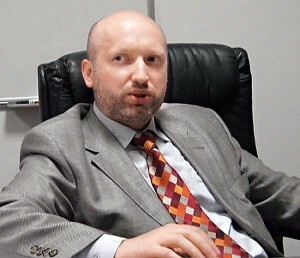 and its pastor, [photo] the former head of Ukrainian intelligence, Oleksandr Turchynov, who is now the acting president of Ukraine. Pray tell, what kind of church is this? You are currently browsing the Mystery Worshiper's Blog blog archives for May, 2014.